Access important tools that help predict and monitor patient response to opioid medications. 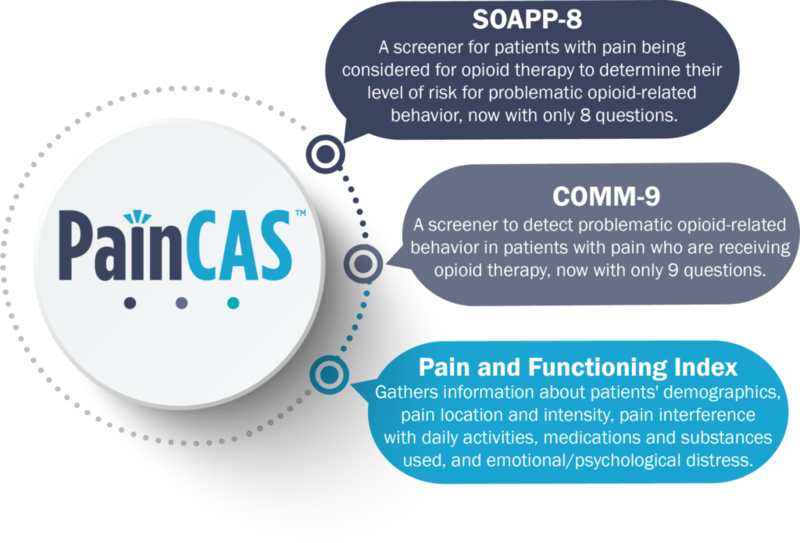 PainCAS eliminates the need for paper scoring and replaces the traditional SOAPP-R and COMM with shortened electronic versions, the SOAPP-8 and COMM-9. The Screener and Opioid Assessment for Patients in Pain (SOAPP®) is a brief self-report tool to facilitate assessment and planning for chronic pain patients being considered for long-term opioid treatment. The new electronic SOAPP-8 includes eight items which have been identified as being the strongest predictors of aberrant drug-related behavior. Importantly, these eight items are able to correctly identify which patients will engage in aberrant medication related behavior with nearly 80% accuracy. SOAPP-8 maintains the same predictive accuracy while reducing the test length by 67%. The Current Opioid Misuse Measure (COMM®) is a self-report screener that helps clinicians identify whether a patient, currently on long-term opioid therapy, may be engaging in aberrant opioid-related behavior. In contrast, the Screener and Opioid Assessment for Patients with Pain (SOAPP) is intended to predict which patients, being considered for long-term opioid therapy, may exhibit aberrant medications behaviors in the future. Since the COMM examines current misuse, it is ideal for helping clinicians monitor patients’ risk of aberrant medication-related behaviors over the course of treatment.